Recently, the U S Navy Bureau of Medicine and Surgery Office of Medical History announced the addition of Archivist Mike Rhode to the staff. I was doing research in the historical library the week Mike came aboard, and I can report that he brings real energy to the Navy’s operation. He brings experience, as well: for 22 1/2 years, he was in charge of the Otis Historical Archives at the Army Medical Museum (just recently folded into the National Museum of Health and Medicine). 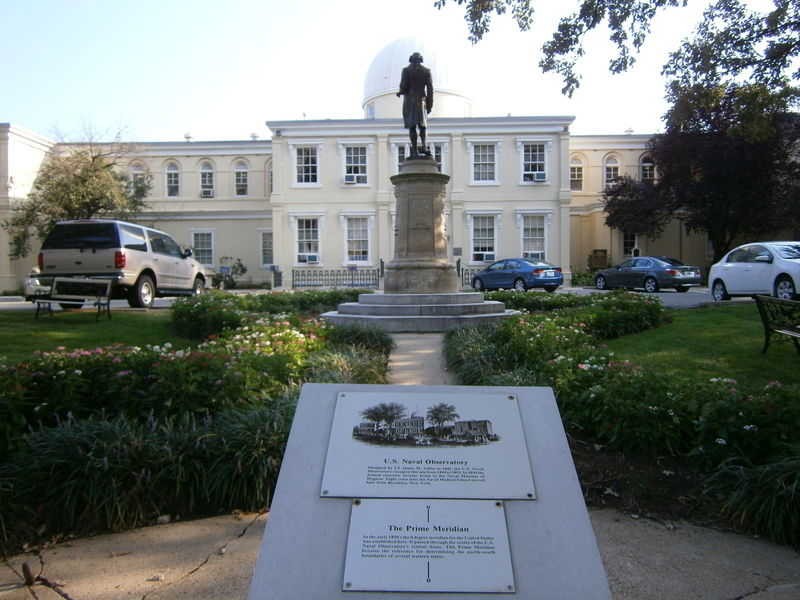 While I was researching at BuMed, located in the old Naval Observatory in Washington DC’s “Foggy Bottom” district, historian Andre Sobocinski pointed out to me that the dome of the observatory once served as a marker for an “American Meridian” (or Washington Meridian). Perhaps in part an expression of revolutionary hubris, Congress established this Meridian in the Navy Appropriation of 1849. It served as the U. S. surveying reference (it was never extensively used for navigational purposes) until we adopted the International Meridian at Greenwich in 1912. Borders of Wyoming, Arizona, Utah and Nevada are based on the American Meridian. (source: http://encyclopedia.gwu.edu/gwencyclopedia/index.php?title=American_Meridian, accessed 30 Sep 2011). Panel One, “The Health of Sailors” featured papers by Professor John Beeler, Dr Cori Convertito-Farrar and Mr Andrew Rath, with Commentary by Professor Chris McKee. Both Professor Beeler’s and Dr Convertito-Farrar’s papers concerned Yellow Fever in the Caribbean in the 18th and 19th centuries while Mr Rath discussed the impact of an Admiral’s suicide upon naval operations in the Pacific during the Crimean War. (Project X231–a World War II study of the effectiveness of ultraviolet lighting in reducing respiratory infections among troops) and Paola Schiappacasse (the history of a quarantine station in Puerto Rico utilizing primary written and archeological resources), and Mr Raed Moustafa (ethical dilemmas facing medical personnel at the U S detainee facility in Guantanamo, Cuba). At the end of each panel, Society Executive Director Captain Tom Snyder presented the student (or recently student) authors, Mr Rath, Mr Moustafa, and Doctors Convertito-Farrar and Schiappacasse with the first-ever Society Graduate Student Travel Grant of $750 each. Our panels, which faced rigorous competition from a large variety of outstanding–if more “traditional”–naval historical fare, were well attended. The Society garnered five new members at Annapolis, bringing our membership to 165 people from around the world. We plan to publish most if not all of these papers in a Session “Proceedings”. This will appear in The Grog, a quarterly digest of naval medical history and heritage published electronically by the Office of Medical History at the U S Navy’s Bureau of Medicine and Surgery. We will announce the publication here. In the evening, a few authors and conference attendees gathered at a local Annapolis restaurant for the “Meeting” portion of our Annual Meeting and Papers Session. Over a pleasant meal, we discussed the panels-just-past, and plans for the Society’s panel at the April 26-29 2012 meeting of the American Association for the History of Medicine in Baltimore. Mark your calendars now and plan to join us! In an earlier post, I detailed this history up to the 1841 Uniform Regulations. Herewith, the story goes forward. A new Navy Regulation in 1852 (2) abolished the gilt “MD” and instead called for “an olive sprig, one inch and a quarter long embroidered at the center” of the shoulder strap, shown here for a medical officer of less than 12 years’ service: (b). The same olive sprig was prescribed for the medical officer’s cap. no corps device identified the shoulder straps of less senior surgeons; here, a shoulder strap for a surgeon with over 5 years, showing only a rank device, the spread oak leaf in silver: (c). Surgeons’ caps carried an “Oak leaf, 9/10 inch in length, embroidered in silver”. Finally, in 1897, the device by which we identify a medical corps officer, the spread oak leaf of dead gold with a silver acorn embroidered at the center, was prescribed. (6) The dark maroon color between rank stripes persisted: (d). 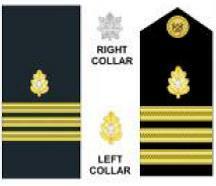 Note that a collar device was also prescribed with the rank at the leading edge and the corps device just aft, worn on both sides of the standing collar. Regulations of 1913 (7) prescribed that Medical reserve officers should sport crimson between sleeve rank stripes, in contrast to the dark maroon required for regular medical corps officers. No Corps device was called for upon the sleeve. (a) Perrenot, Preston B, “United States Navy Grade Insignia, 1776-1852”, pdf, 2010. Available for purchase on line at http://www.docstoc.com/docs/27090993/UNITED-STATES-NAVY-GRADE-INSIGNIA-1776-1852. (c) Ibid., O-1945, NU-Uniforms, U. S. Navy, Officers, and Men. Box No 359, File “Box#359/03”, 1862, Uniform for Officers of the United States Navy As Prescribed in the General Order of the Secretary of the Navy Dated July 31, 1862. 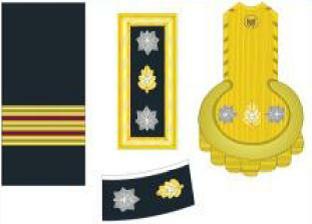 (d) Perrenot, Preston C., “United States Navy Grade Insignia Since 1852”, pdf, 2010. 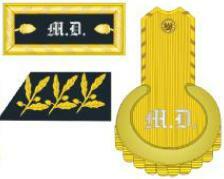 Available for purchase on line at http://www.docstoc.com/docs/27091267/UNITED-STATES-NAVY-GRADE-INSIGNIA-SINCE-1852. I found one error is this publication:the medical corps device is shown the compiler’s illustration of the 1883-1897 insignia is the modern version–the spread gold oak leaf with silver acorn embroidered at its center–rather than the Maltese Cross with small maroon velvet Geneva cross at its center called for in Navy Uniform Regulations. The modern device was introduced in 1897. (1) Naval History and Heritage Command, Navy Department Library, RARE VC 303 .E39 MSS Box 4, Published uniform regulations and changes to 1781-1942, File: William Edwards Collection Resolutions, Regulations, and Circular Letters 1781 – 1889, page “1847”, REGULATION CHANGES AND MODIFICATIONS OF UNIFORM, Navy Department, May 27, 1847. (2) ibid., page “1852”, REGULATION NAVY DEPARTMENT, September 24, 1852, UNIFORM OF SURGEONS AND PURSERS. (3) ibid., page “11 November 1863”, ARTICLE APPEARING IN THE ARMY AND NAVY JOURNAL DATED NOBEMBER 21, 1863, “CHANGES IN NAVY UNIFORMS”. (4) ibid;, page “1869”, GENERAL ORDER No. 90 NAVY DEPARTMENT, Washington, March 11, 1869. (5) National Archives and Records Administration (“NARA 1”), Records Group 45, Office of Naval Records and Library, Subject File, U. S. Navy, 1775-1910, 0-1945, NU- Uniforms, U. S. Navy, Officers, and Men. Box No 359, Volume, “Regulations Relating to the Uniform of the Officers of the United States Navy, Navy Department, January 22, 1883”, paragraph “Corps Devices”. (6) ibid., Volume “Regulations Governing the Uniforms of Commissioned Officers, Warrant Officers, and Enlisted Men of the Navy of the United States, with Plates, 1897 (with typewritten annotation ‘July 1, 1897’)”, p 14, paragraph “Corps Devices”. (7) San Diego Navy Historical Foundation, Inc., “Uniform Regulations of the United States Navy, Together with Uniform Regulations Common to Both Navy and Marine Corps, Navy Department, [January 25] 1913, page 32, paragraph 72. http://www.quarterdeck.org/uniforms/1913/Uniform%20Regulations%201913.pdf, accessed 7 Sep 2011. (8) Naval History and heritage Command, The Navy Department Library, “Insignias”, http://www.history.navy.mil/library/online/uniform_insignia.htm, accessed 7 Sep 2011, section “Insignia of the Medical Corps”. Lt Kenneth Lankin, MC, USN (Lankin, Kenneth M, “The History of the Navy Medical Corps Insignia: A Case for Diagnosis”, MilMed 156, 11:615, 1991) gives the date for this change as 1918, and cites Tily, J. C., “The Uniforms of the United States Navy”, New York, A. S. Barnes and Company, 1964, p 174.